First To Go - The Work of Airborne Forces Experimental Establishment at Ringway, Sherburn-in-Elmet & Beaulieu 1940-50, by Alan Brown. From the intriduction: This book is a tribute to the small teams at Airborne Forces Experimental Establishment who first tested new aircraft and equipment before they passed into service use. The book charts the history of the establishment, and is illustrated throughout with several drawings. 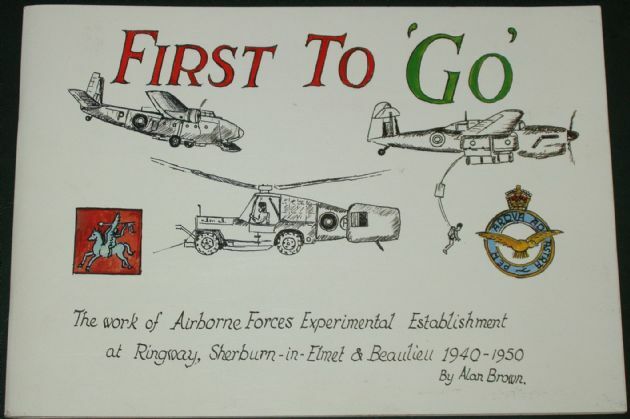 Their are chapters on the early formation of the Central Landing Establishment, its development in the Airborne Forces Experimental Establishment, the early tests of Parachute Aircraft and parachutes, the testing of aircraft such as the Albermarle, Dakota, Halifax and Stirling, the opening of bases at Sherburn-in-Elmet and Beaulieu, testing the Dual X parachute, Post War Aircraft, and much more! The condition of the booklet is generally good. The cover has some minor scuffs and blemishes, and some light wear along the edges and corners, but the staple spine is intact, and all pages are intact, unblemished and tightly bound. There is a small area of wear on the rear side coverwhere a price sticker has been partially removed.